MainAll NewsUS & CanadaBiden Close to Announcing Presidential Run? Biden Close to Announcing Presidential Run? 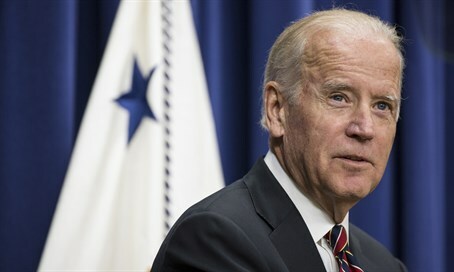 American news outlets say Vice President Biden is inching closer towards announcing his intention to run for president. Vice President Joe Biden is reportedly inching closer towards announcing his intention to seek the Democratic nomination for president, American media reported Monday. A source familiar with the process told CNN that Biden’s associates are setting up interviews for potential staff positions on a Biden presidential campaign. The interviews come as the political world waits for a decision from Biden on whether he will enter the Democratic 2016 presidential primary. Biden is set to meet with his top political advisers Monday night -- the same group he met with at least twice last week, noted CNN. Biden spoke Monday at a White House summit on climate change but offered no clues about his pending decision, the network said. He opened the session, to which he was 10 minutes behind schedule, by calling himself "the late Joe Biden" and saying he'd spent the last two hours meeting with President Barack Obama "on other matters" -- which he didn't further explain. Treasury Secretary Jack Lew was also scheduled to be in that meeting. But Pennsylvania Democratic Rep. Brendan Boyle tweeted Monday morning that he has a source who says Biden will run for president, and later said he is confident his information is accurate and that an announcement is coming "very soon." "If he didn't run, it would be pulling back from a decision that's already been made," Boyle told CNN. He declined to reveal his source but described it as "very close to the Biden camp." The reports follow a poll last week which found that almost half of American Democrats want Biden to challenge front-runner Hillary Clinton in the 2016 presidential race. 48 percent of Democrats surveyed in the poll wish he were a candidate, compared with 30 percent who said he should stay out. Clinton has been perceived as increasingly politically vulnerable as questions persist over her use of a private email server while she was secretary of state in the Obama administration.. The earliest filing deadlines to enter states' primaries come at the end of October, noted CNN, imposing a deadline that could force Biden to make a decision or risk losing delegates he would need if locked in a close battle with Clinton and Sanders. White House Press Secretary Josh Earnest said he didn't know when Biden will make or announce his decision. "The the laws of physics will require that this be a decision that will be announced relatively soon, since the date of these contests is coming up," Earnest told reporters during his Monday briefing. "But for the precise date, that's something only the vice president knows."